Peckish for pacu? Also known as the “vegetarian piranha,” the large South American freshwater fish weighs upwards of 60 pounds, and is cousin to the ferocious meat-eating piranha. Although pacu isn’t voracious for flesh like the piranha, it still is an omnivore with a preference for plants, and it’s actually much larger than its tinier, razor toothed relative. If hungry enough, the fish will feed on other animals.There have been reports of pacu attacks on children, who have been bitten by their odd, human-like, square teeth. Thanks to chef Ricardo Zarate and his Paiche Peruvian Izakaya, opening April 12 in Marina Del Rey (yes, Marina Del Rey), you won’t need to book a flight to Peru or brave the murky, inhospitable waters of the Amazon and risk becoming fish food to quell your pacu craving. Nope, chef Zarate has all that handled. He’ll even cook it for you. The rib portion of the pacu is the centerpiece at Paiche. The moist meat with skin intact is pan seared and then broiled. 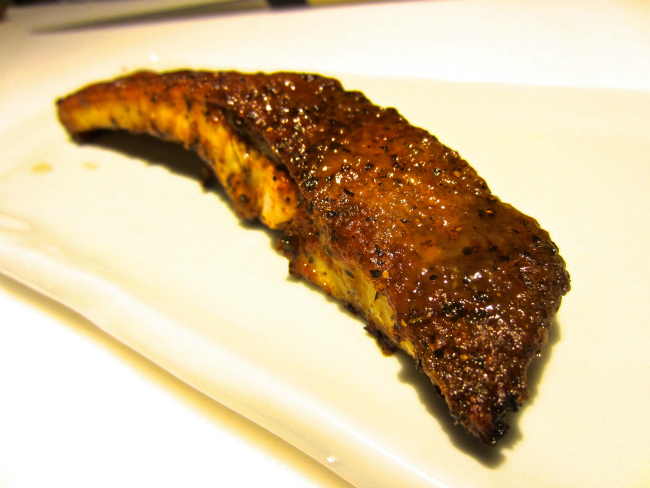 An exceptionally fiery South American pepper called rocoto is blended with a teriyaki glaze and coated on the ribs to achieve a sweet and savory crust that caramelizes to the point of charring. A zapallo gourd purée smooths everything out with a gentle, sweet creaminess. The result is something remarkable, similar to sea bass but more flavorful—like eating a crispy fish pork belly, if there was such a thing. Formerly known to me as the Prime Minister of Alpaca because of his many alpaca plates at his flagship, Mo-Chica, Zarate has now upped his status to the Fresh Prince of Piranha. That’s a good thing.